Abebeyahu, the leader of the new Cooperative. 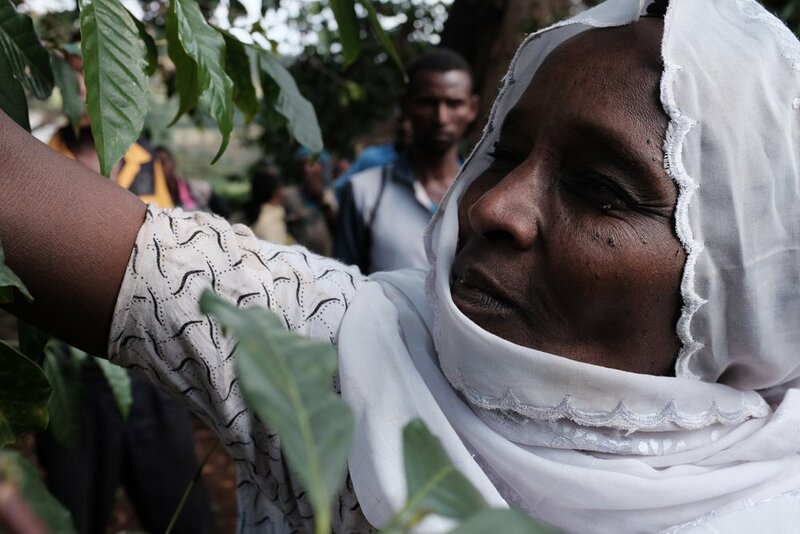 In 2014, Abebeyahu Negash, a quiet farmer from the Gololcha area of Arsi, Harar, contacted us with a request that we taste his coffee and share our findings. In the coffee we found a promise of the famous “Harar flavor”, and in Abebeyahu we found a new partner to make Direct Trade a reality. Abebeyahu brought together 23 farmers in his area, some related to him (father Negash and brother Negesse both joined the group) and others lifelong friends, to form a brand-new cooperative union, the Tiret Coffee Producer’s Cooperative Association, which in 2015 achieved recognition by the ECX without a single bribe—a huge accomplishment. The farmers of Gololcha are remarkable in Ethiopia for their agricultural approach. Where many producers practice basic subsistence farming techniques and do not plan ahead for improved crops in the future, Abebeyahu and his friends practice advanced concepts such as intercropping, mulching and fertilizing, crop rotation, and proper spacing for root development. They are famed for their white honey, as well. This dedicated approach is used for the onions, teff, beans, and other products they grow, but especially pays off in the coffee. 2015 held many achievements for the Tiret Cooperative: attaining export license, exporting its first shipping container of coffee, and seeing the Tiret Community Blend achieve a Grade 2 ranking from the CLU, or Central Liquoring Unit. 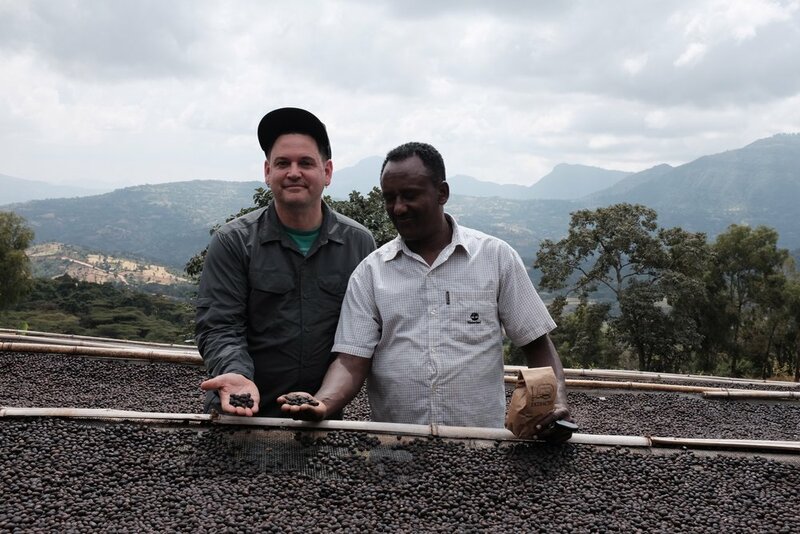 This was exciting, and we all celebrated, while still recognizing many quality issues that arose; one main issue was that many of the farmers do not have raised drying beds, so the coffee was dried on cement or dirt patios, resulting in less clarity in the cup. For 2016, we have spent many hours identifying quality control points that could be improved and in November, we visited many of the farms and tried some experiments as well as made a presentation on these quality points. Given the financial challenges for the poorer cooperative members, we, and our partner organization Dominion Trading, each donated $900 to provide 10-15 farmers with drying beds for the current harvest. We experimented with small plastic floating tanks to reduce inconsistencies by removing the lower-density cherries, with great success. The community welcomed us with so much joy and delight that when, two weeks before our visit, unseasonal rains wiped out a bridge on the usual rough road, they banded together and with axes and picks hacked a brand-new road to the coffee farms out of Engule Mountain. Ours were the first vehicles to pass, and we were welcomed with high-pitched ululations and shrieks of joy. It's hard work to visit Gololcha. You have to fly to Addis Ababa and then put in a couple of hard-driving, dusty days in a Land Rover hitting your head on the roll bar, and ultimately ride a tubby donkey to reach the vicinity of the farms, then trek on foot through lush undergrowth and past many fields to the top of Mount Engule. We were in fact only the second buyers to have visited, and the first with long-term intention. This year, 4-year-old Eire McIntyre accompanied us in the capacity of cultural ambassador and donkey-petter, though she passed on the beer-heavy celebratory dance under the stars at the end of our visit. Each time we visit, each time we taste the coffee (50 microlots and counting for 2017/18), and each time we share the story with our community, we are inspired to give our tiret, our best effort, to this project and making it succeed for everyone.